NEW ORLEANS – After falling from No. 1 to as far back as No. 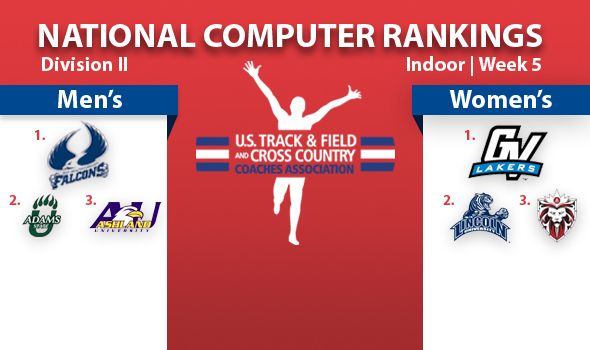 4 in the U.S. Track & Field and Cross Country Coaches Association (USTFCCCA) National Team Computer Rankings, the Adams State men are within a tenth of a point of overtaking the top spot from Saint Augustine’s, while the Grand Valley State women remain at the head of the rankings. Just nine-tenths of a team point separate No. 2 Adams State (203.42) from Saint Augustine’s (203.51) -the smallest margin between No. 1 and 2 in indoor DII rankings history – and the Grizzlies are charging hard. Adams State gained 25.73 net points behind the division’s top-ranked distance medley relay team (Stevens, Rider, Daniels, Batt), which turned in a qualifying time of 9:40.02 converted from 10:03.22 for track size and altitude. The Falcons of Saint Augustine’s, meanwhile, dropped 6.81 net points. Ashland slid to No. 3 after being displaced by Adams State, but is just four team points off the national lead with 199.27 team points. Grand Canyon (138.63) and Grand Valley State (123.39) remain at No. 4 and No. 5, respectively. For the 22nd straight week the GVSU women’s team remains atop the rankings, though the Lakers lost 15.86 net points for a team total of 177.76. No. 2 Lincoln (Mo.) could not capitalize on the Lakers’ loss, as the Blue Tigers made minimal gains by way of losing fewer points, down 13.66 for a team score of 163.07. No. 3 Academy of Art (160.18) moved within three points of a top-two spot after gaining 1.34 net points, while No. 4 Grand Canyon (140.65) made the biggest move in the top five with a net gain of 22.59 points on strong performances in the sprints and pole vault. Adams State (121.86) moved up a spot to round out the top five, following their male teammates’ lead and making a charge back toward the top after falling to a program-low 13th ranking two weeks ago. The National Computer Team Rankings project how a team will finish in a National Championship Meet setting, rather than a triangular or dual. The rankings are compiled from meet data in the 2012-13 season. The next round of computer rankings will be released February 26. The 2013 NCAA Division II Indoor Track & Field Championships will be held in Birmingham, Ala., March 7-9.